HOT DEAL: Yamaha slashes price of RX-V667 AV amp to £350 | What Hi-Fi? That takes the Yamaha down from £450 to £350, undercutting the Pioneer by £49. 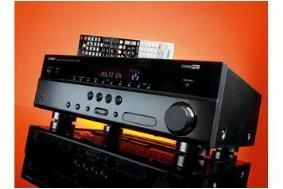 We reckon that's top value, as the Yamaha is 3D-capable, has a stack of connectvity, HD audio decoding, auto set-up and a detailed, atmospheric sound. Head down to your local Yamaha retailer for full details of the £100 discount offer. Only while stocks last.